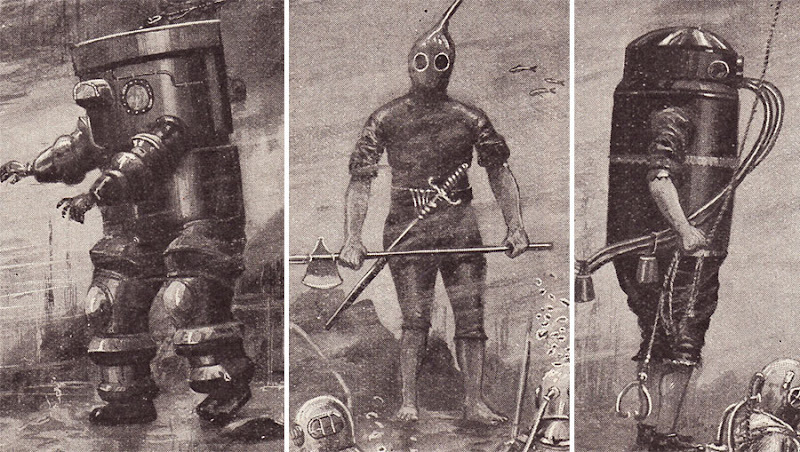 This time, we thought we’d take an in-depth look at diving suits, those strange looking costumes that many of us have seen before, on TV, in movies or maybe even in real life. 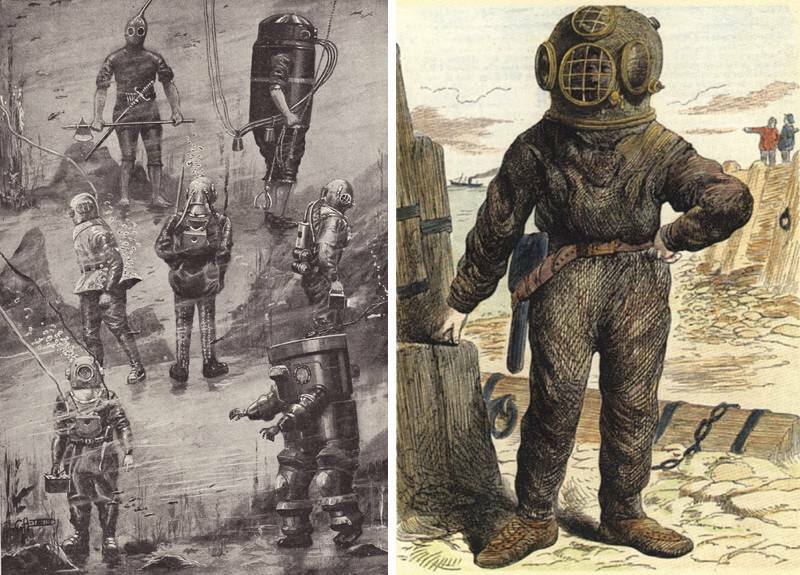 The diving suits known as standard diving dress had a metallic helmet, made of brass, bronze or copper, an airline or hose supplying air from the surface, a canvas diving suit, weighted boots and were equipped with a knife, just in case. 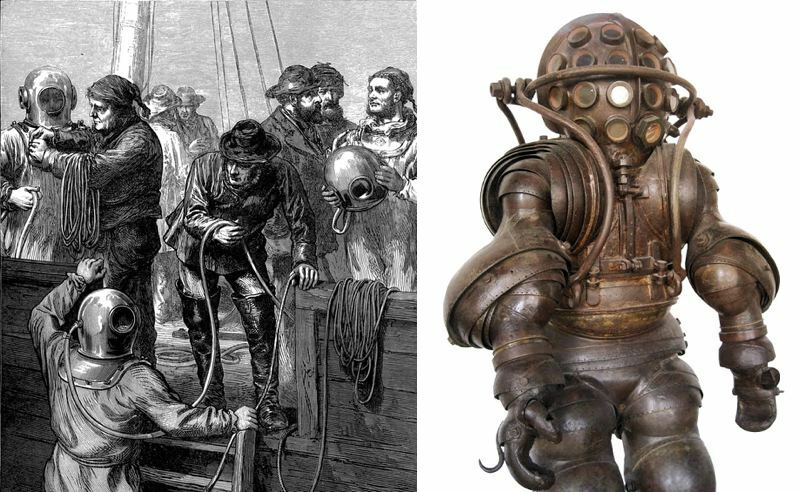 The suits had other lead weights too, usually fitted on the chest or back, to help the diver descend to the required depth. 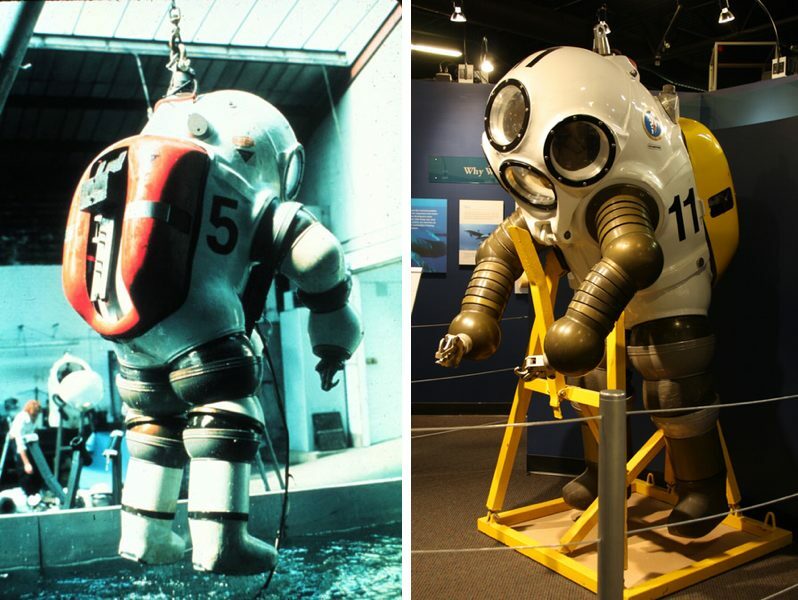 These types of suits aren’t used that often these days, but although they are the diving suits that most people are familiar with, they weren’t the first ones to be developed. 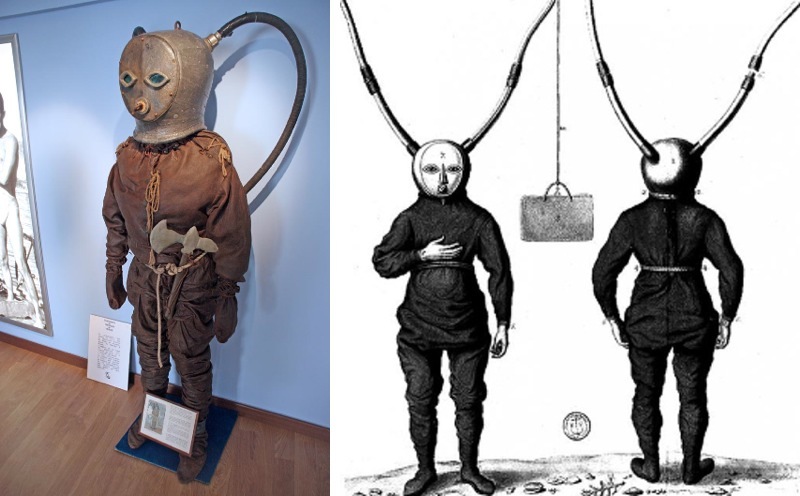 In 1906, de Pluvy created one of the very first atmospheric diving suits. 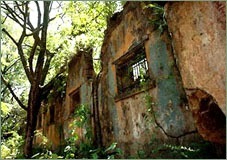 He claimed to have completed a number of dives to depths of up to 100 meters. 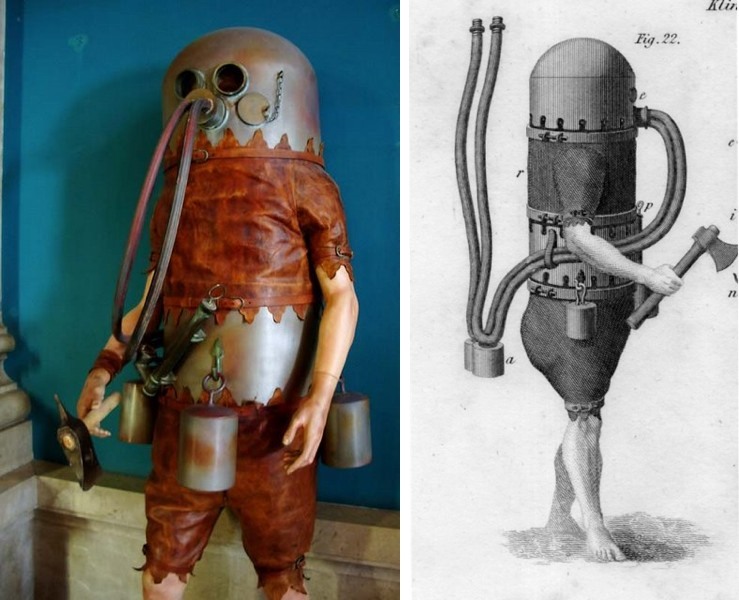 The joints were apparently made of leather and rubber, but the suit does seem to have worked, even it does resemble a robot from a 1950s science fiction movie. 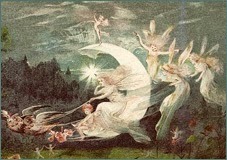 This one on the right is also from the early 1900s and seems to be the famous William Walker, who heroically saved Winchester Cathedral from collapsing in 1905 - read the full story here. 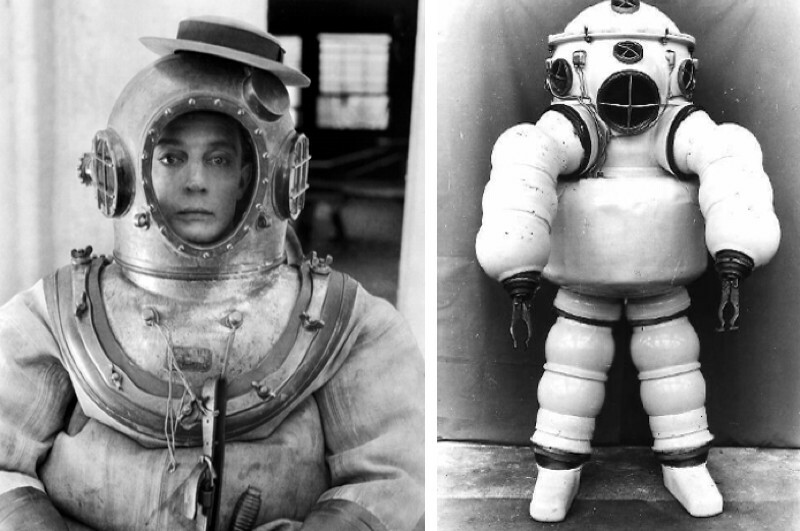 Here’s American silent movie comedian Buster Keaton (1895-1966), wearing a diving suit for a scene from The Navigator, released in 1924. Keaton even wears his distinctive hat on top of the helmet, just in case he didn’t stand out enough from the other members of the cast. 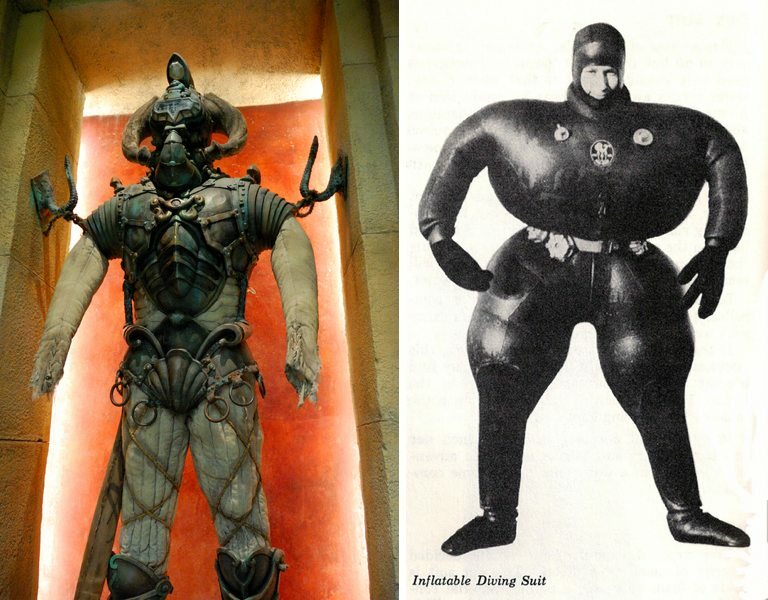 In 1935, J. Peress’ dive suit, Tritonia, (left) explored the wreck of the Lusitania, which was sunk by a German U-Boat off the coast of Ireland in 1915. 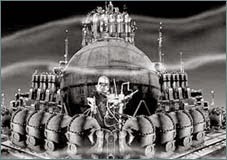 Peress’ chief diver was Jim Jarrett, who descended to 95 meters. The suit he used was a forerunner of the JIM suit, which was named after him (see later in article). The two divers on the right look to be either preparing for, or maybe recovering from, an undersea mission of their own. 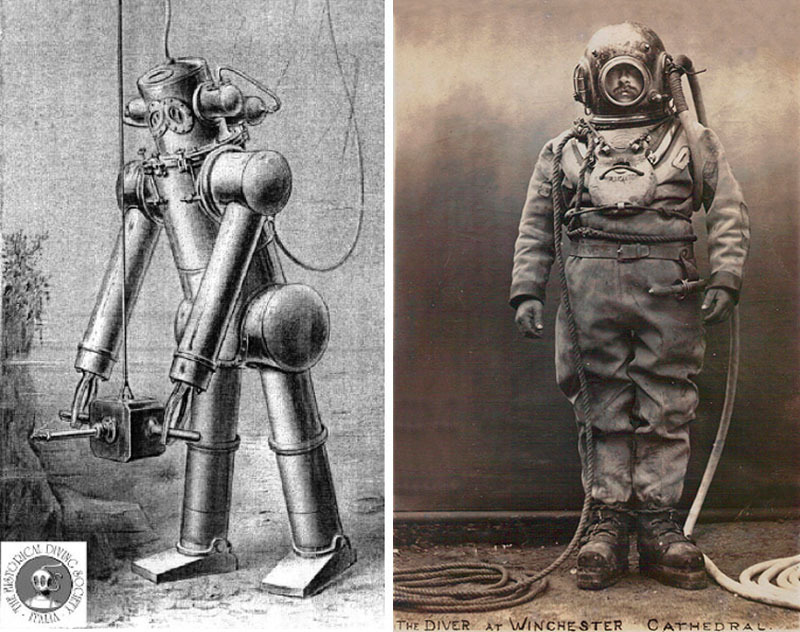 Atmospheric Diving Suits (ADS) were first used in the oil industry then later developed by the Navy for submarine rescue missions. 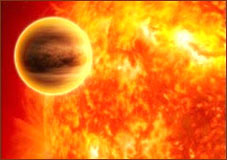 The pressure inside ADS is the same as it is on the surface. 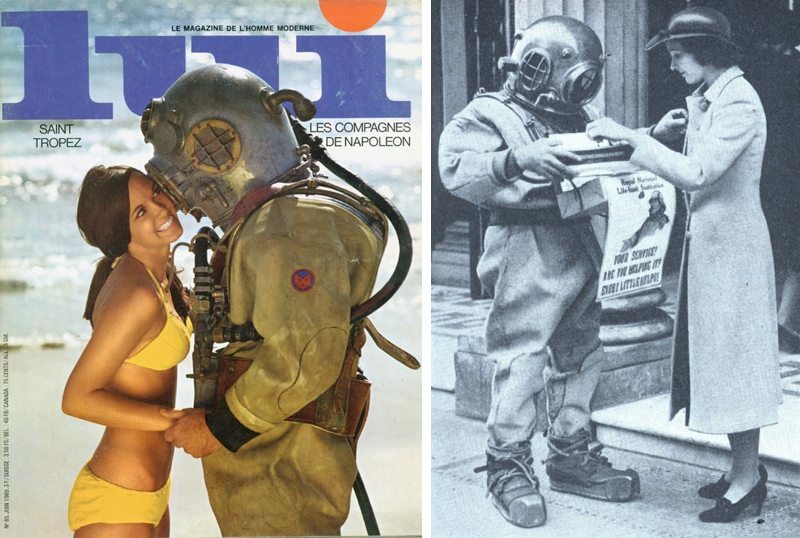 This allows divers wearing ADS to work at extreme depths without having to decompress on their return to dry land. 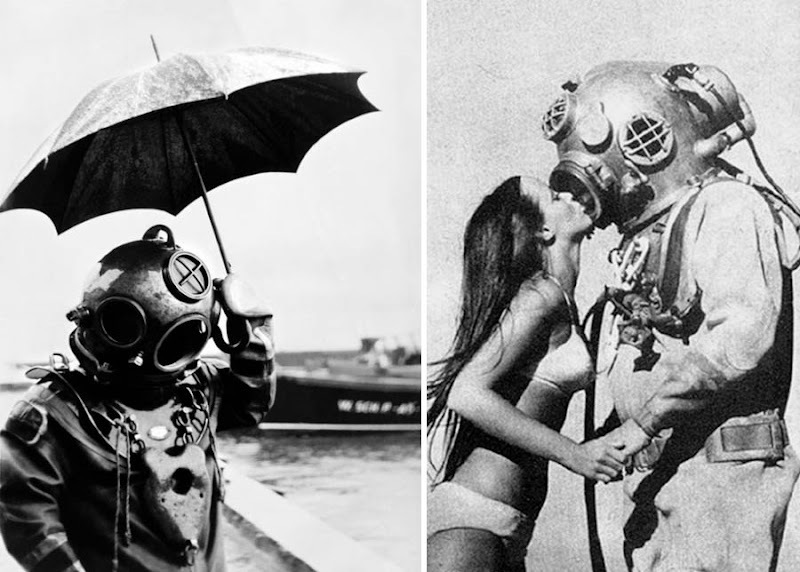 The JIM atmospheric diving suit is named after Jim Jarrett, the chief diver of the suit’s designer, J. Peress. 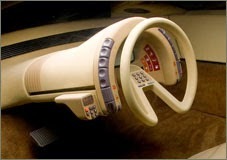 The JIM was developed in the late 1960s and was basically a one-person submarine. 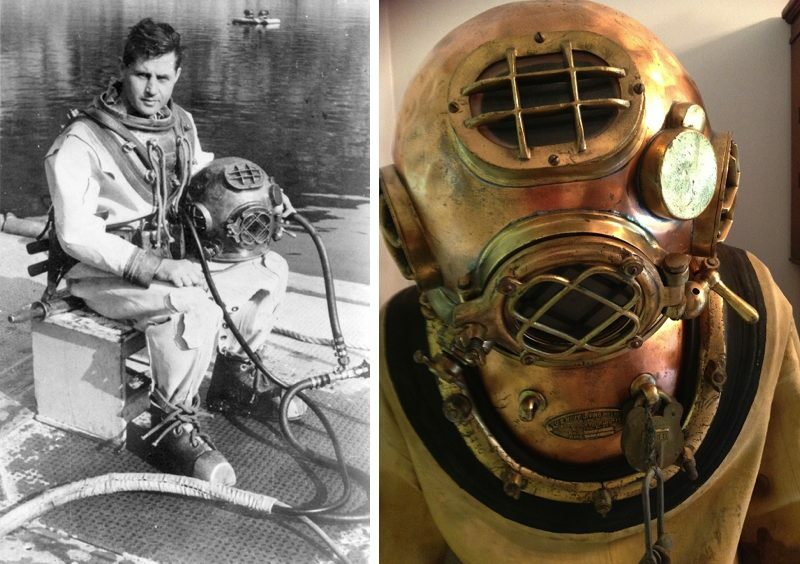 Divers no longer had to experience freezing water, complex gas mixtures, and potential decompression sickness. They could breath normal air, return to the surface quickly and even dress casually inside the suit, with most divers choosing to wear a thick wool sweater. 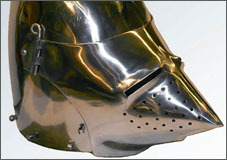 The JIM was first used in 1974 by the oil industry in the Canary Islands. 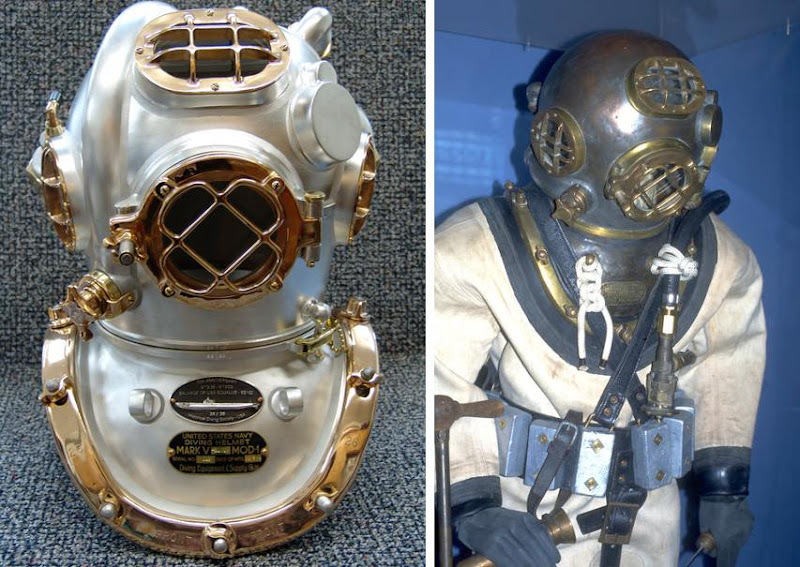 In 1976, divers used the JIM at an oil well in the Arctic, working for six hours at a depth of 275 meters. 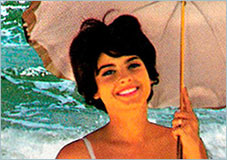 In 1979, Sylvia Earle set a world record in the JIM. She descended to 381 meters and walked around on the sea floor for two and a half hours, a record that has never been bettered, so far. 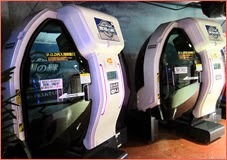 The JIMs were still in use during the 1980s, before being surpassed by the WASP suit. Tintin, a heroic Belgian reporter (left) who has had many exciting adventures, first appeared in print in 1929. Tintin was created by Georges Remi (1907-1983), who wrote under the pen name Herge. 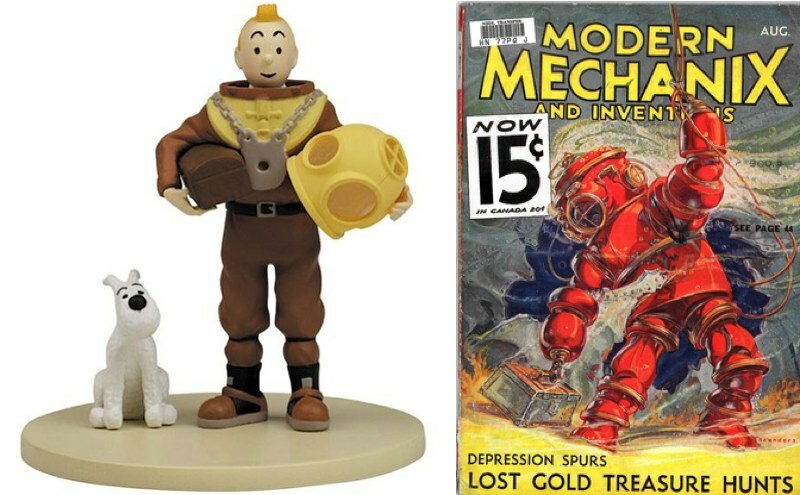 This modern figurine is based on the Tintin story Red Rackham’s Treasure. With his faithful dog Snowy at his side, Tintin prepares to dive down to explore the wreck of The Unicorn. 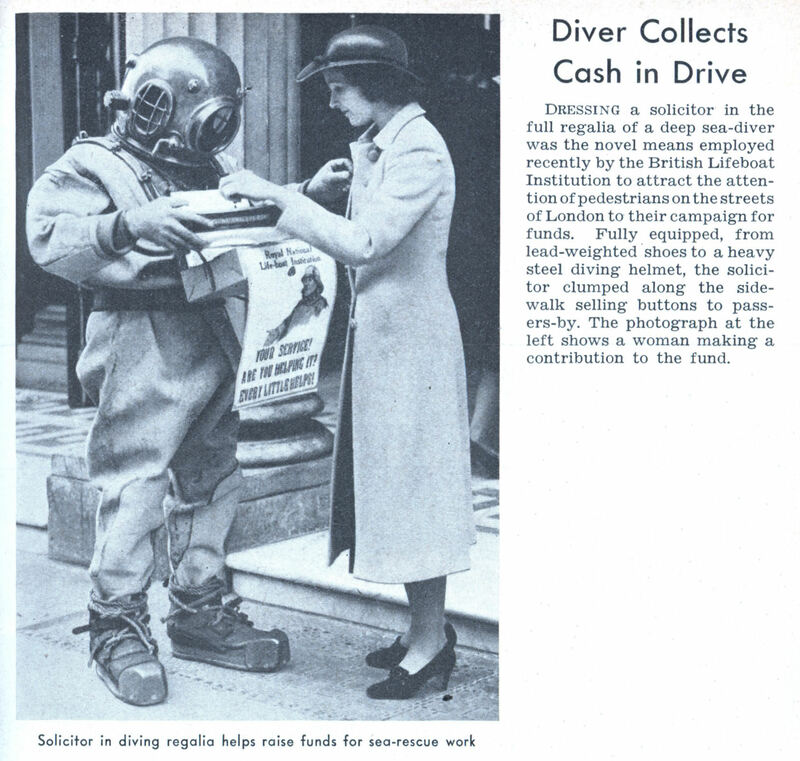 The August 1933 issue of Modern Mechanix and Inventions also featured undersea treasure hunting, with the hero’s very striking red gear guaranteed to make him stand out amongst the other residents of the ocean floor. 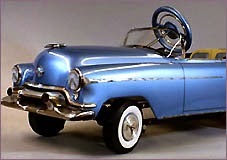 Diver Dan’s adventures were shown on children’s television in the early 60s. 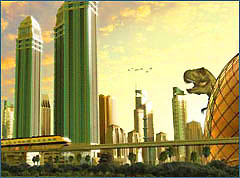 This is the DVD cover (left) from a few years ago, bringing Dan to a whole new audience. 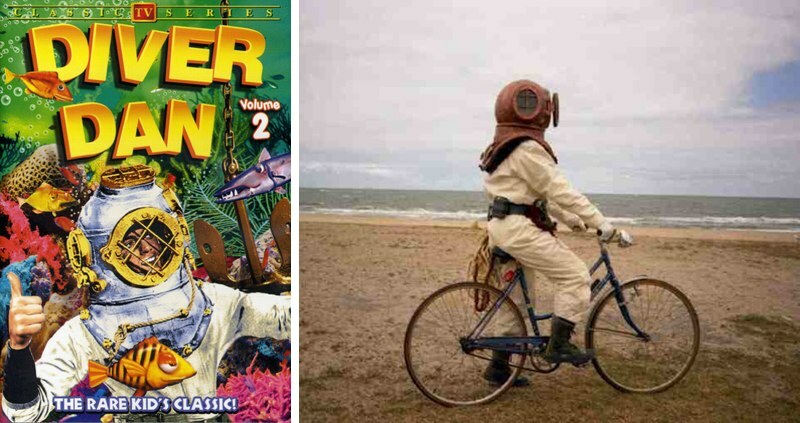 I don’t think Dan ever conducted his exciting nautical adventures on a bicycle (right). 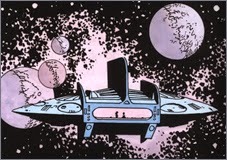 Still, who knows, it might have been his preferred mode of transportation to travel to the set every day? 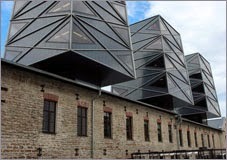 This is a fascinating post full of amazing photos, thanks for sharing it!